February Resolution: A Month-Long Passport to … ? Back again with my 2013 Monthly Blogging Resolutions! 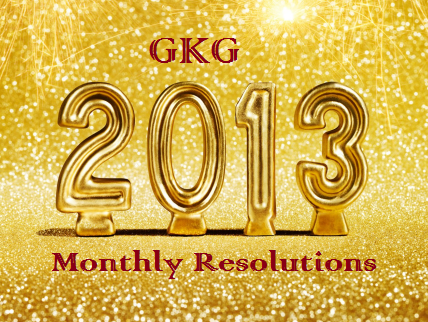 As I posted a month ago, I’ll be tackling monthly resolutions about GKG all through 2013. Rather than a few year-long goals, I’ve broken them up into month-by-month challenges. Here’s to growth and new adventures! Want to read the original post? Check out all of my 2013 girls here! Image sourced from thepioneerwoman.com. Nommy nom nom. 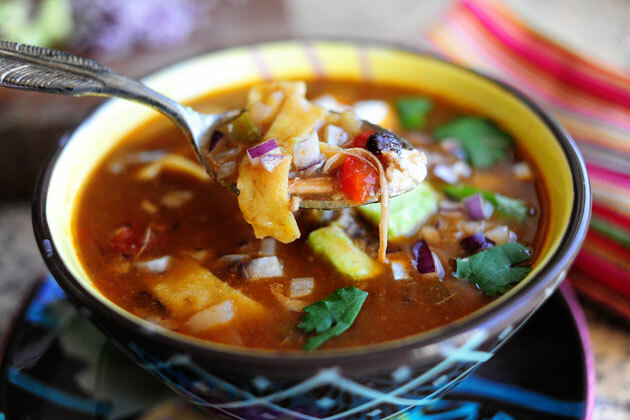 Cook a huge batch of soup, stew, or chili and divide it into individual portions. 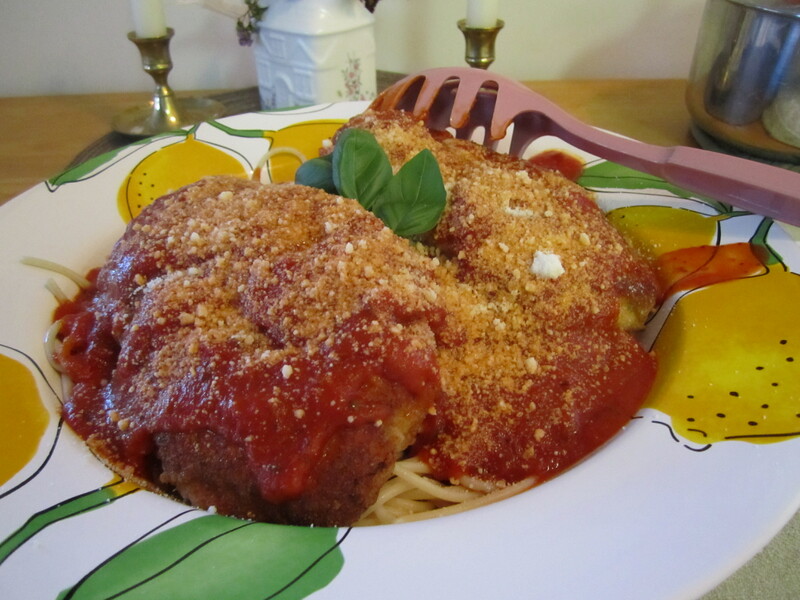 When the History Teacher mentioned a craving for Chicken Parm recently, he and I both took a peek or two at various recipes in our collections. (Cookbooks, magazines, Pinterest — which is slowly becoming a recipe book-sized collection in itself!) Each recipe we found, it seemed, called for lots of oil, gobs of cheese, and a few more calories than either of us might need in one meal. Or an entire day. 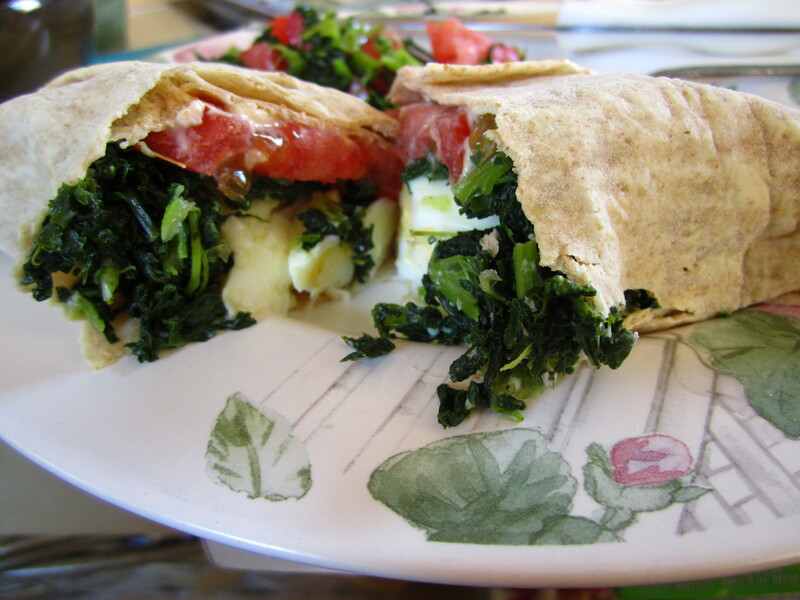 I decided to tackle the beast that was one of Italian-American cuisine’s most iconic dishes, but in a healthier way. Could it be done? Would it be a fruitless effort, like whoever decided to try manufacturing fat-free ice cream? (Oxymoronic at best, nasty at worst. Oif.) Would I end up with a chicken-tasting hockey puck of low-fat grossness? Time would tell. Pound the chicken breasts to tenderize the meat. Downplay the cheese by only adding enough for flavor, rather than letting the chicken drown in fromaggio. 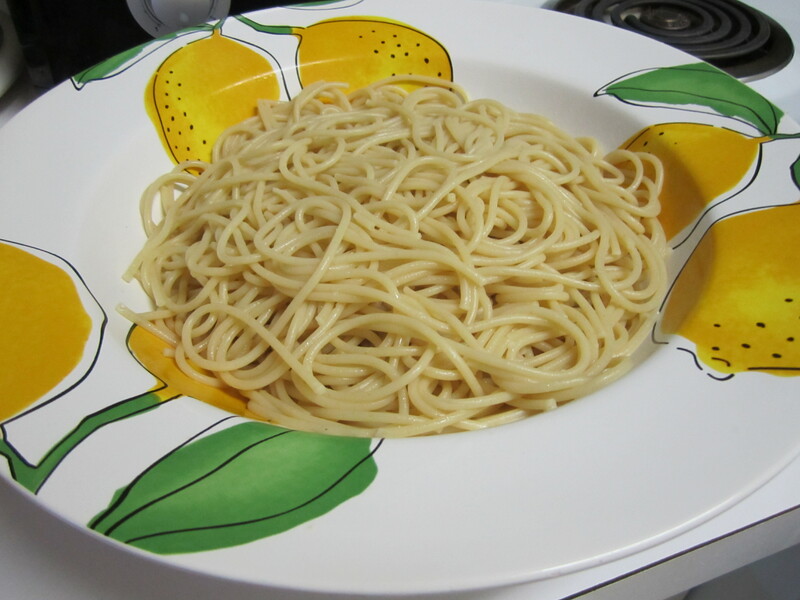 If you have it, use whole-wheat pasta, which has a nuttier flavor and a hefty “bite” when cooked al dente. 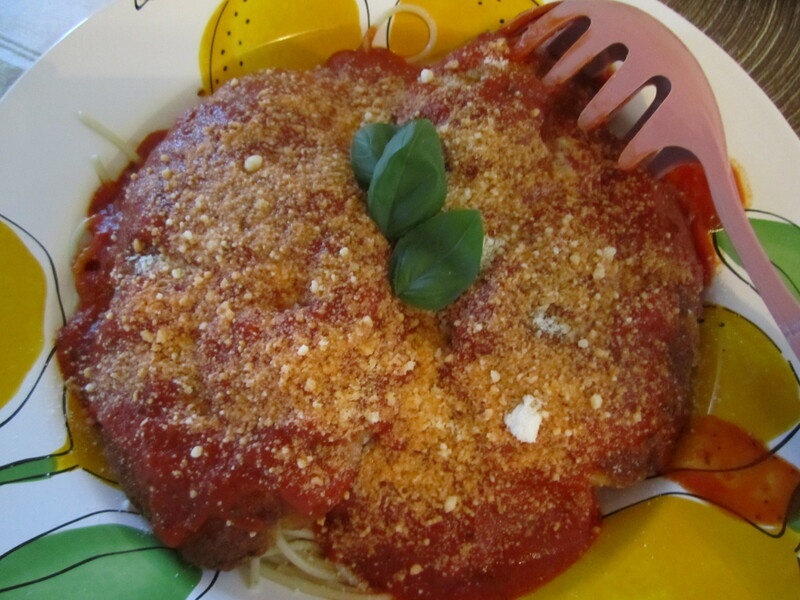 And so, friends, here’s my recipe for an easy and surprisingly healthful Chicken Parmigiana. It’s really the meat-pounding-and-double-breading that makes this recipe special, and the techniques are so simple that they can be easily applied to any cut of meat that you choose. Try it with pork chops, chicken thighs, or even a thin steak if you’re feeling particularly Southern. Happy eating! Preheat the oven to 350 degrees F. Meanwhile, set a pot of water (with a pinch of salt) to boil on high heat. In a small saucepan, heat 2-3 cups pasta sauce. Arrange 3 bowls or serving dishes. In the first, add the flour, some salt & pepper, and 1/2 of the herbs. In the 2nd, add the beaten egg (with an optional pinch of garlic salt). In the third, add the breadcrumbs, Parmesan and the rest of the herbs. Dredge the pounded breasts first in flour (shaking off the excess), then in egg, and finally in the breadcrumb and Parmesan mixture. Set aside on a serving dish. Heat 1 tbsp olive oil in a medium-sized skillet over medium heat. (Optional: Add 1/2 tsp butter to the pan for additional flavor. Add the chicken breasts (2 at a time) and cook for 4-5 minutes on each side, or until well browned. When browned, transfer to a lightly sprayed baking sheet. Bake for an additional 10-15 minutes, or until completely cooked through. 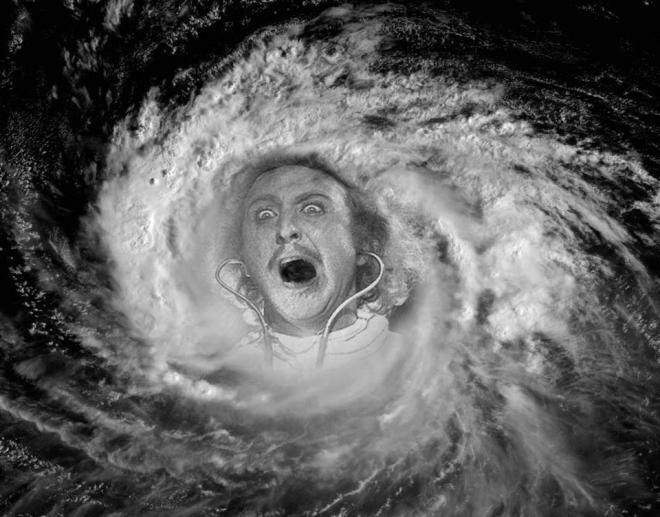 “Hissssss.” — Breadcrumb coating meets olive oil. Meanwhile, cook pasta according to package directions. Drain, rinse lightly, and transfer to serving bowl / dish. Drizzle lightly with olive oil and a little remaining pasta water to keep pasta from sticking together until chicken is done. Lonely pasta, just waiting for some friends. 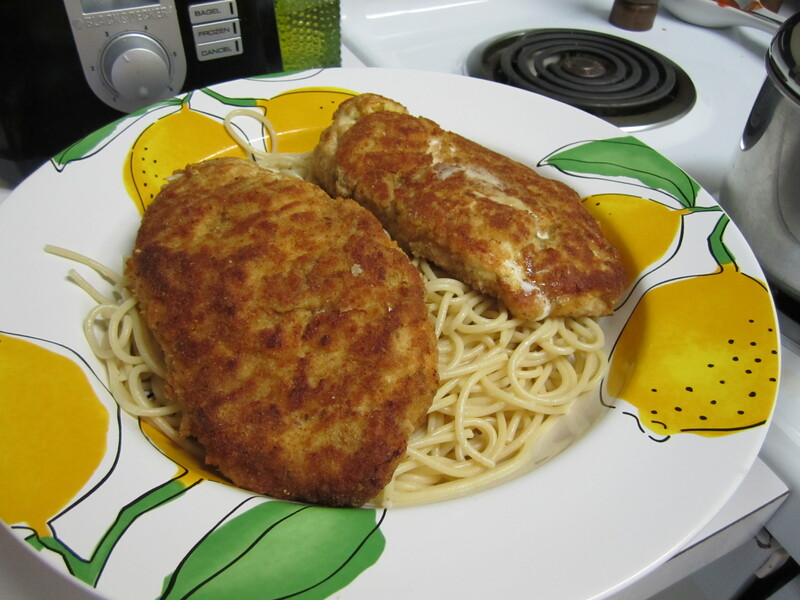 To serve, top pasta with chicken breasts. 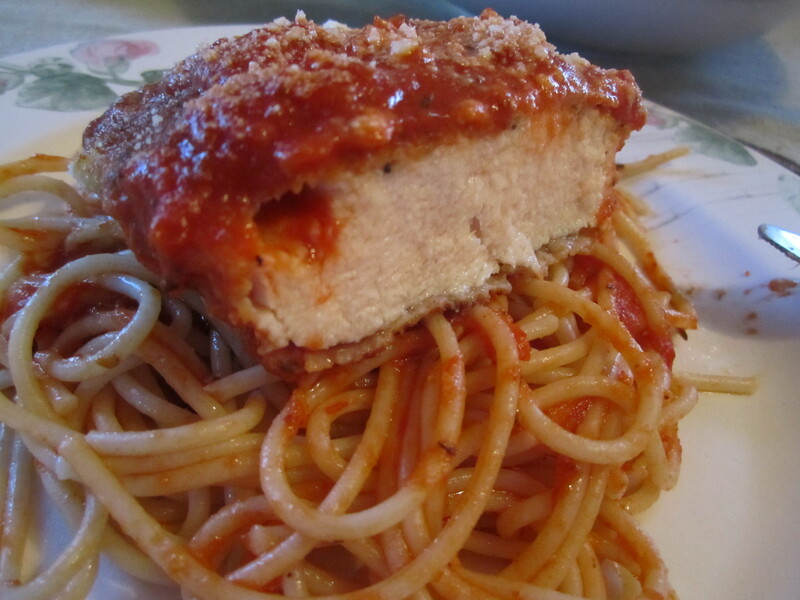 Spoon sauce over breasts and pasta until well-covered. Sprinkle with Parmesan cheese to garnish, and top with additional dried or fresh herbs. Serve to the hungry hordes! Almost ready! Check out that sweet crumb-coating. Oh yeah. Sauce & cheese take that chicken to the next level. Lastly, what really makes the dish is that double-breading. It creates a crisp coating that locks in moisture, leaving your chicken breasts juicy and the outsides browned, crunchy and delicious. You really can’t go wrong! Are you guys fans of this Italian-American classic? 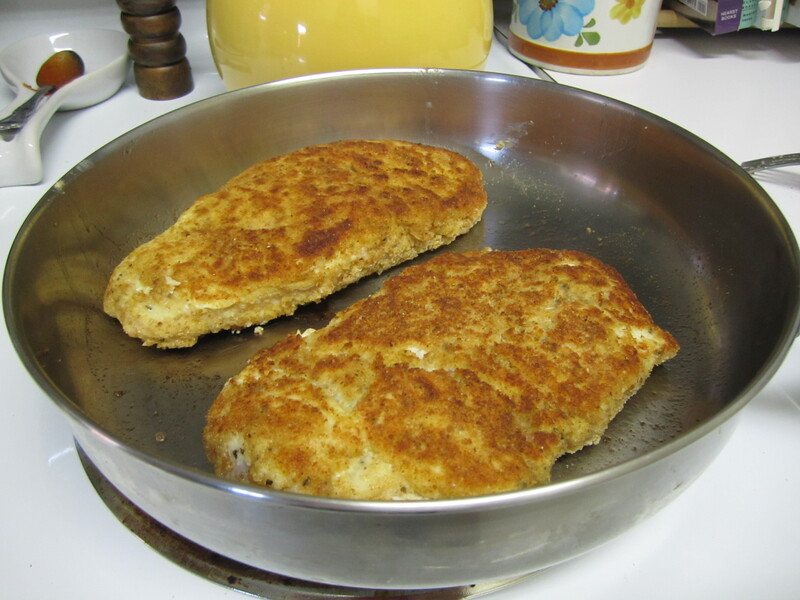 Have you ever double-breaded chicken breasts before? What are your favorite techniques for recreating this dish at home?